AIIMS (All India Institute of Medical Science) Exam is conducted each year for taking admission in the best medical college in the country. All India Institute of Medical Science, conducting body holds AIIMS MBBS Exam for taking admission in various AIIMS colleges such as New Delhi, Bhubaneswar, Bhopal, Rishikesh, Patna, Raipur, and Jodhpur for MBBS programme. MBBS 2019 Exam will be conducted for filling up close to 700 Seats in various MBBS Colleges. Aspirants are expected to know all the important details pertaining to AIIMS MBBS 2019 Exam. Please read below to know all the AIIMS MBBS 2019 Details such as Application Form, Eligibility Criteria, Exam Pattern, Qualification, Result. AIIMS (All India Institute of Medical Science) is a national level medical entrance exam in India. It is conducted by AIIMS, New Delhi offering candidates to take admission in various AIIMS colleges in the country for close to 700 seats. AIIMS MBBS 2019 Exam is considered to be one of the toughest competitive examinations in the country thanks to the humongous number of the applicants. || Candidates who want to take admission in undergraduate MBBS programme for AIIMS college must fill up the AIIMS MBBS 2019 Application Form before the closing date. Candidates are advised to apply for AIIMS MBBS 2019 Application Form online only. Please read further to know more about AIIMS MBBS 2019 Application Form such as How to apply, AIIMS MBBS 2019 Application Fee etc. Commencement of AIIMS MBBS 2019 Application will be from the third week of February 2019. AIIMS MBBS 2019 Application Form will be available in Online mode only. Interested candidate must check their eligibility for AIIMS MBBS 2019 Exam before filling up the AIIMS MBBS 2019 Application Form. Candidates are advised to keep their documents beforehand applying for AIIMS MBBS 2019 Application Form such as Scanned and signature. Candidates are suggested to read the instructions carefully before filling up the AIIMS MBBS 2019 Application Form. Applicants must have cleared 12th Board or equivalent from a recognized Board/Institute. Candidate must be at least of 17 years age as on or before the time of AIIMS MBBS 2019 Examination. AIIMS MBBS 2019 Application Form fee can be paid by either Online or Offline mode. Those candidates wish to make payment via Online mode can use Credit/Debit Card or NetBanking. Offline payment for AIIMS MBBS 2019 Application Form can be done through e-Challan issued by SBI Bank. Note: Applicants shall keep the Payment receipt for future use. For students visiting for the first time, must select MBBS Course in the Registration Window. Now, click on “New Registration”, will be navigated to a new page containing instructions. Candidates are suggested to read all instructions carefully before filling up the AIIMS MBBS 2019 Application Form. After reading click on proceed further to continue. Now, AIIMS MBBS 2019 Application Form will display on the screen, candidates can fill up all the required fields. 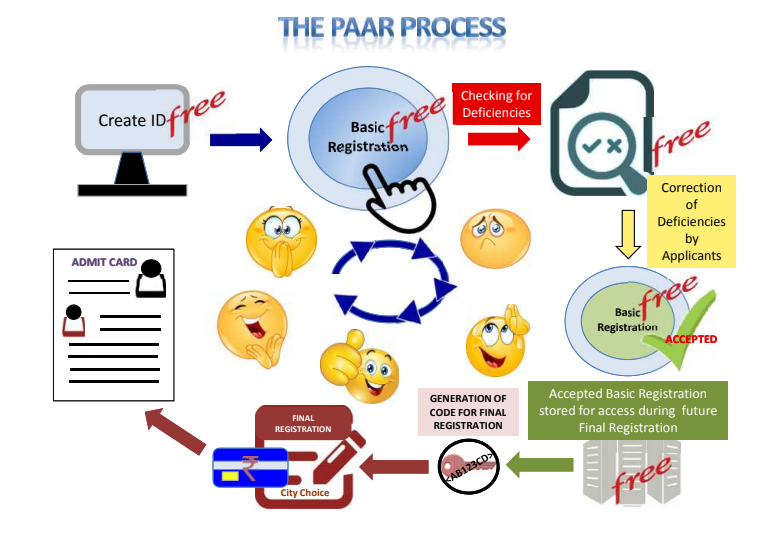 Before submission of Registration Form, the student must recheck all the entered details then click on checkbox having declaration/undertaking and clicking on “save and proceed” button to move forward. A confirmation page will display containing all the entered details, students will have the opportunity to correct/edit the entered details in case of any incorrect details entered by students. Click on the “edit button” to modify the details else save the details and submit the AIIMS MBBS 2019 Registration form. The successful submission will enable the confirmation message on your registered Mobile No and registered email Id enclosing Application No. and Password along with the status of the AIIMS MBBS 2019 Application. Those students who already registered can log in by entering details such as Application No. and Password (Password created during the registration process). Passport size coloured photograph with white background. Photograph dimension having 3.5cm in width and 4.5cm in height. The colored photograph must be updated not older than six months from the registration. The scanned signature must be having a white background. The student must use either black or blue point pen for signature want to upload. Signature dimension having 6cm in height and 3cm in width. The thumb must be impressed by the white background only. Thumb impression dimension having 4cm in height and 3cm in width. Selection of Examination Center: After successful payment of AIIMS MBBS 2019 Application Fee, students can select the Examination city. PrintOut the AIIMS MBBS 2019 Application Form: Once student complete all the procedures students are suggested to take printouts of the completely filled AIIMS MBBS 2019 Registration Form for future use and keep it safe. AIIMS MBBS 2019 Eligibility Criteria must be rendered by Candidate who wants to appear for AIIMS MBBS 2019 Exam. It is to be noted that AIIMS New Delhi the organizing body for AIIMS MBBS 2019 Exam decides the Eligibility Criteria, Academic Qualification and other details for AIIMS MBBS 2019 Exam. Candidate’s eligibility criteria will vary considering various factors such as Candidates Category. AIIMS MBBS 2019 Exam is conducted to allow all the aspirants to take admission in the premier medical college in the country. Please read below to know your eligibility for AIIMS MBBS 2019 Exam in detail. Applicants who want to apply for AIIMS MBBS 2019 Exam can be Citizen of India. No. of Attempts: There is no as such limit in appearing for AIIMS MBBS Exam. Candidate must have cleared 12th Board or equivalent from a recognized Board/Institute. Candidate must have passed Higher Secondary having Physics, Chemistry, Biology as the compulsory subject along with English. Those students who are appearing for 12th Board/Higher Secondary in 2019 can also apply for AIIMS MBBS 2019 Exam but they will have to produce the provisional certificate at the time of AIIMS MBBS 2019 Counselling. Please note the minimum marks required in Physics, Chemistry, and Biology (PCB) aggregate to make the candidate eligible to appear in the AIIMS 2019 Exam. OCI Applicants are also eligible to apply for the AIIMS MBBS 2019 Exam. All the eligibility criteria will be applicable as per the Indian National. OCI Applicants must produce the proof of residence as when required. AIIMS MBBS 2019 Exam Pattern includes all the details of the AIIMS MBBS 2019 Exam such as Important Topics to prepare, Format of the AIIMS Question Paper, Total No. of the Questions as, Distribution of the Question Paper form different subjects, Marking Scheme of the Question Paper etc. AIIMS MBBS 2019 Exam is a very competitive National Level Entrance Exam, offering admission to the premier Medical college in India. AIIMS New Delhi, the organizing body will release official Notification pertaining to complete details for AIIMS MBBS 2019 Exam such as AIIMS MBBS 2019 Application Form, AIIMS MBBS 2019 Exam Pattern etc. AIIMS MBBS 2019 Question Paper will be strictly based on Official Notifications. Candidates should know the complete details about AIIMS MBBS 2019 Exam Pattern to prepare better. Please read below to know all the details of AIIMS MBBS 2019 Exam Pattern. Candidate will be awarded one mark for each correct responses while One-third (1/3 Marks) will be deducted for each incorrect responses. Students will be given multiple options for each question in the paper where they have to mark only response. Students will receive One mark for each correct responses. One-third (1/3) Mark will be deducted for each incorrect responses. AIIMS 2019 Syllabus will be based on 11th and 12th Standard subjects. AIIMS MBBS 201Questions will be asked from Physics, Chemistry, Zoology, Botany and General Awareness (Aptitude). Students can also check the AIIMS MBBS 2019 Exam Pattern to better understand the AIIMS MBBS 2019 Question Paper and It will boost their AIIMS MBBS 2019 Exam Preparation. AIIMS MBBS 2019 Admit Card is the entry card required for AIIMS MBBS 2019 Candidates in the examination hall. AIIMS MBBS 2019 Admit Card will be provided to all those students who successfully registered and filled the AIIMS MBBS 2019 Application Form before the closing date. All eligible candidates can download the AIIMS MBBS 2019 Admit Card from the first week of May 2019 once it will be made available on the official portal. Students are advised to download the AIIMS MBBS 2019 Admit Card before the closing date. AIMS MBBS 2019 Admit Card will be available Online only. Please continue reading to know every detail of AIIMS MBBS 2019 Admit Card such as how to download the AIIMS MBBS 2019 Admit Card, AIIMS MBBS 2019 Admit Card details, etc. 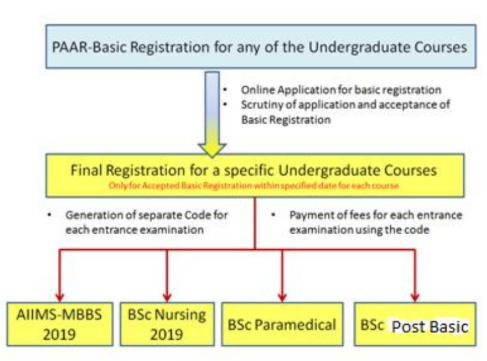 AIIMS MBBS 2019 Admit Card will be available online from the first week of May 2019. Candidates can download the AIIMS MBBS 2019 Admit Card from official portal only. AIIMS MBBS 2019 Admit Card will contain all the information pertaining to the candidate and AIIMS MBBS 2019 Exam. It is important to note that only those students who completed the AIIMS MBBS 2019 Application will be provided with the AIIMS MBBS 2019 Admit Card. Candidate will have to carry at least one photo ID proof such as Aadhar Card along with AIIMS MBBS 2019 Admit Card. Without AIIMS MBBS 2019 Admit Card, the student will not be allowed to appear in the Examination Hall. All candidates are advised to take few printouts of AIIMS MBBS 2019 Admit Card for future use. Go to the official portal or alternatively click on “AIIMS MBBS 2019 Admit Card” (Link will be provided later) to download the AIIMS 2019 Admit Card. You shall be directed to the page, here you have to login by entering your AIIMS MBBS 2019 Application No. and Password. Now click on “Login” Button before checking the details you entered correctly. Students can see their AIIMS MBBS 2019 Admit Card. Now compare your important information such as Name, Application No, before downloading. Download AIIMS MBBS 2019 Admit Card. Take few printouts of AIIMS MBBS 2019 Admit Card for future reference. Students are suggested to not forget to bring the AIIMS MBBS 2019 Admit Card in the Examination Hall. Instructions to be followed in the Examination Hall. AIIMS 2019 Cut-Off will be published by AIIMS New Delhi, Regulating body responsible for regulation of most popular All Indian Institute of Medical Sciences (AIIMS) Entrance Exam. Qualified students of AIIMS MBBS 2019 Exam will get the opportunity to participate in AIIMS MBBS 2019 Counselling Process. Please read below to know more about AIIMS MBBS 2019 Cut Off such as last year Cut-Offs, Category Rank/Merit list etc. AIIMS MBBS 2019 Cut-Off Marks will indicate least marks student must score to be considered as Qualified in the AIIMS MBBS 2019 Exam. Candidate can check through AIIMS MBBS 2019 Cut-Off declaration, that whether they will get shortlisted for AIIMS MBBS 2019 Merit List. AIIMS MBBS 2019 Cut-Off Marks will be published independently for different Categories (SC/ST/OBC/GEN/PH). Students who will score more than qualifying marks in the AIIMS MBBS 2019 Exam will be considered as qualified and called for AIIMS MBBS 2019 Counselling process. AIIMS New Delhi has released the AIIMS MBBS Result 2017 in the month of June along with AIIMS MBBS 2017 Cut-Off based on Category. Having any query regarding Apply for AIIMS MBBS 2019 then you can visit aiims official website at https://www.aiimsexams.org. while apply need any help contact using below contact id. Having any query or update you can also visit the official website.